getText() : Returns the full text currently being edited. setText(string) : Replaces full text being edited with string. 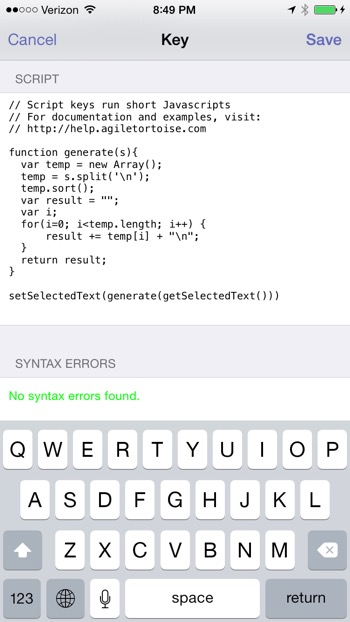 getSelectedText() : Return only the selected text. If no text selection exists, this will return an empty string. setSelectedText(string) : Replace only the current selected text range with the string. Also updates the selected range to match any change in length of the new string. getTextInRange(start, length) : Return text in the request range. setTextInRange(start, length, string) : Replace the text in the specified range with the value of string. setSelectedRange(start, length) : Set the selected range of text. Invalid ranges will be automatically adjusted, and this text selection will be applied after successful completion of the script. I wouldn't classify myself as O.C.D. I like to think I'm more pedantic that anything else. When it comes to lists, sometimes it really bothers me when they're not in sort order. This is especially true of Markdown lists that are only keyed off the first list item. I use this all the time and it's terrific. Those are the three reasons I keep returning to Drafts for basic notes. It's the jumping off point for words. I don't sit and write in Drafts, but I could. I don't archive all of my notes in Drafts, but I could. What I do, is launch Drafts and write about a hundred times a day. I use Drafts because it's a world of options.